Choosing eyeglasses is not easy, especially when you're confronted with a vast selection to choose from and you have no idea where to start! Glasses become a focal point, being one of the first things noticed about you, so it's important to choose eyeglasses that flatter you and are consistent with the image you want to portray. If you wear prescription eyeglasses every day you should consider investing in more than 1 pair, for instance, 1 pair for business wear, 1 pair for leisure wear and 1 pair of sunglasses. Your prescription -- some prescriptions may require a minimum or maximum frame depth or thickness of glass, placing limitations on frames that will be suitable. Make sure you check for restrictions with your optician before you start your selection process. Face shape -- your glasses should balance your face shape. The "ideal" face shape is oval, other face shapes should choose glasses that create a more oval appearance. For example, if you have a pear or triangle face shape choose a frame that is as wide as your jaw line. Determine your face shape here. Facial features -- when we choose glasses that repeat an element within our facial features it emphasizes that feature and makes it more prominent. The aim is to reflect the features that we want to accentuate and not to repeat the features we wish to minimize. The "trick" is to work out your dominate facial characteristics and their attributes. 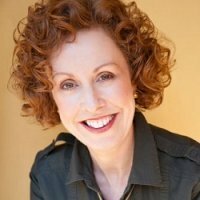 Look at each of your features: your face shape (sides of face, jaw line and hairline); eyes; eyebrows; nose (sides and tip); and mouth (resting and smiling). Is your face made up of more curves than angles or vice versa? Are your features evenly placed in your face? Are your features large or small? Work out which facial feature or features you want to reinforce and repeat it in the same scale and proportions in your glasses. For example, to emphasize a square jaw and angles in your facial features choose square corners on the frame. To emphasize a rounded jaw line, almond eyes and a similarly shaped mouth choose the same shape in the eyes of the eyeglass frames. Body scale -- choose glasses that are in keeping with your body scale and the size of your facial features. For example, if you have a small body scale then choose frames with a small to medium-thick frame. Lifestyle -- consider where you will wear the glasses. Will they be practical for the activity or event? For example: will they stay on for your sporting activity? Transition lenses are not good if your work involves frequent meetings -- if you come in from outside and go straight into the meeting your glasses will be in sunglass mode meaning your eyes are hidden, which is not good for effective communication. Style personality -- And finally, do the glasses reflect your personality and complete the image you wish to project? For example, if you favor dramatic, statement clothes and accessories you will be best with statement eyeglasses as well. Go for bold colors, exaggerated design details and heavy-looking frames rather than frameless or light-looking glasses. When you need your next pair of glasses, instead of just going for the same style you've always gone for, try incorporating at least some of the tips above. If you're not sure what style personality you are, or which category the glasses fit into, try on as many different styles as possible that fit the other criteria (face shape, facial features and so on) to get a feel for the types of styles that look best on you. One great way to do this is by trying on virtual eyeglasses. GlassesUSA (they ship worldwide) not only have a great selection of eyewear, but they also offer a virtual mirror to try on their glasses. You can choose whether to upload a photo from your PC,use your Webcam to take your photo, or use one of their models. 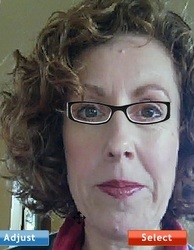 I had fun trying it out to demonstrate some of the tips for choosing eyeglasses above. Take a look at the pictures and my comments below. My face shape is oblong. My facial features are more curved than angular. My style personality is primarily natural, then classic (with a creative bent). My scale is medium. My coloring is Warm Autumn (aka Warm and Muted). 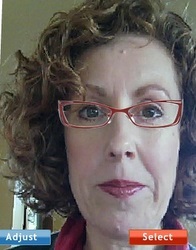 Eyeglasses make me look too frumpy! and see how they mimic my eye shape and eyebrow curve? 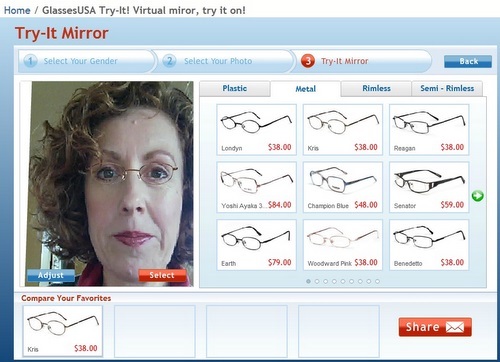 Try out the GlassesUSA virtual mirror for yourself.